Will and Mina’s treasure hunt turns up only terror when they start fighting over what resources to look for. 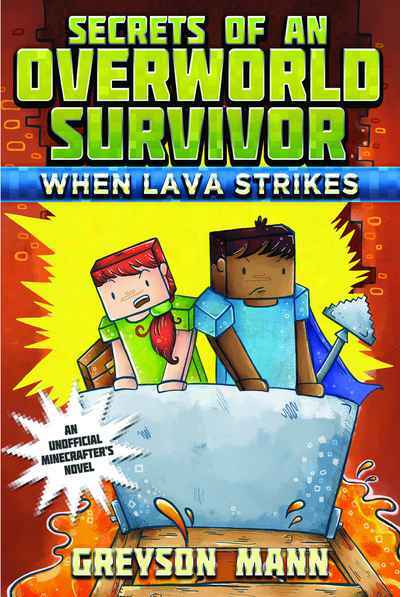 But when lava strikes, can they work together to survive? When Will and Mina discover an abandoned mine shaft, they quickly plan a treasure hunt. The two friends dream of the riches they’ll unearth together and can’t wait to get started, but they quickly discover that they very different ideas about what treasure is! Torn between searching for mobs and potion supplies and seeking out the chest at the heart of the mine, the duo is on the verge of splitting up. But then a trio of treasure hunters challenge Will and Mina, and a poorly aimed pickaxe puts everyone in the mine in danger. As the chambers around them fill with lava and their hunt for treasure becomes a fight for survival, can Will and Mina put their differences aside and work together to escape with their lives? Every chapter of this second installment in the Secrets of an Overworld Survivor chapter book series is packed with adventure—perfect for introducing young gamers to reading!